Mondays are appearing too fast. Barely blinked my eyes and Monday is at my doorstep. Imagine, nearly half of 2106 is getting over. For the 43rd #FoodieMonday #Bloghop, our theme was #Ramadan Special. What is Ramadan(Ramazan)? Ramadan is the ninth month of the Muslim calendar during which all devout Muslims fast from sunrise to sunset for the whole month. Observing fast during this month is considered one of the highest form of Islamic worship. Muslims believe that the holy text Quran was first revealed during the ninth month. Islam follow the lunar calendar, therefore fasting month each year varies. This time round its June -July. That means Muslims in some countries like Iceland, Germany, Norway, Sweden etc will be practically fasting for over 20 hours. Fasting begins at sunrise and ends at sunset. That means Muslims abstain from any type of food and water during that period. Some families prefer a few snacks for iftar before having dinner later on. Most Muslim families in Mombasa will have samosas as a part of their iftar. Its during Ramadan we get to see dates, samosas, mamri, makate sinya, kaimati, vitumbua, dal bhajia,vibibi being sold in abundance everywhere. Besides that lots of white radishes and raw pawpaw ‘noodles’ are sold. Its believed that having a radish is cooling for the digestive system. The raw paw paw noodles are used either to tenderize meat or cooked in milk or coconut milk to make a kheer like dessert. I decided to make samosas for Ramadan Special as no Iftar at a Muslim home in Mombasa is complete without samosas. They may not have them everyday, but it is a common snack that most enjoy. My mother in law’s friend doesn’t forget to send home made samosas for us at least once during the month of Ramadan. Most of use beef, mutton or chicken mince for the filling. I being a vegetarian, decided to make paneer samosas. A variety of vegetables or lentils too can be used as a filling. Add lemon juice and water and make a soft dough. It should not be sticky or too hard. Cover the bowl with a lid and let the dough rest for 30 minutes. Add cumin seeds. As soon they begin to sizzle, add hing. Add the paneer and stir fry for 20-30 secs. You don’t want to overcook the paneer otherwise it will become dry. Take the pan off the heat. Add ginger, chillis and onion. Mix and let the mixture cool down. Add coriander, salt, sugar, lemon juice, peas, clove and cinnamon powder. Put a tawa or frying pan over low heat. Using some flour, roll out one piece of the dough into a 2″ circle. Do the same with the second piece of dough. Smear each circle with about a ½ tsp of oil. Dip the oiled part in the flour. Sandwich both the pieces with the oil and floured part inside. Using extra flour roll out the sandwiched dough into a circle of about 8″. Make sure you don’t get any folds or creases so roll the dough carefully and keep on turning it so that both parts roll equally. Place the rolled circle on the tawa. Roast both sides just for 15 – 20 secs. Peel both the rotis apart carefully. Be careful that the hot steam does not scald you. Cover the rotis with a kitchen towel so that they remain moist. Repeat steps 3 -11 using the remaining dough. So in total you will have rolled out 6 rotis. Mix the plain flour and water to make the glue or paste. Cut each roti into half. Trim the thick part of the arc on both sides. Now you will have a trapezium shape. With the shorter side facing away from you, fold one half exactly in the middle. Fold the other part over it to form a cone shape. (see the photos). Stick the overlapped part to the under part using the glue or paste. Now you have a hollow triangle shape. Put about 1-1½ tsp of the filling and gently press it down. Apply the glue or past on the top flaps. Close the filled hollow with the flaps. Voila, you have a perfect triangle. Repeat steps 4-9 with the remaining patti or pastry. Heat oil in a wok, frying pan or karai over medium heat. Put a small part of the trimmed patti in the hot oil. If it sizzles up immediately then the oil is ready. Reduce the heat and semi fry 6- 8 samosas. That means don’t fry till they are golden brown. Fry them for a 30-40 secs and put them in a colander. At this stage you can freeze the samosas when they cool down. Just before serving, heat the oil up over medium heat. When its hot, add 6-8 samosas, reduce the heat and fry till they are golden brown in colour. Remember to keep turning them over while frying. Serve hot samosas with lemon wedges and your favourite chutney. Don’t fry the samosas over high heat. The pastry will become brown but the inside part of the pastry will be raw. Remember the trimmed parts? Well don’t throw them away. Fry them, add a bit of red chilli powder and serve as a crunchy snack. If you have any filling left, make a sandwich. Roll out the rotis evenly. Thick parts make it difficult to fold the patti/pastry. To make mini samosas divide the dough into 16 to 18 parts. Roll the rotis to a diameter of 6″. 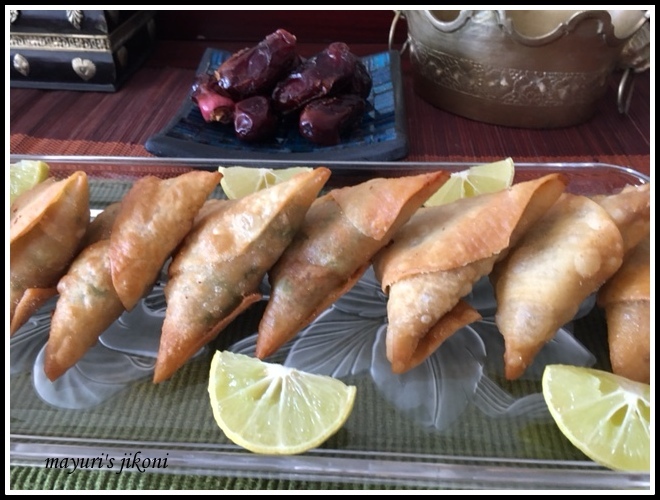 You can use ready made samosa patti (manda) or even the wonton wrappers which are readily available in grocery stores or supermarkets. Don’t overfill the samosas otherwise the pastry will tear. Be careful when folding the triangles. You don’t want the tips to have large holes as oil will get into the filling. delicious love with a cup of tea. Mouthwatering share dee and through you we are getting to know so much about African food. Mayuri, These look wonderful! The filling has my mouth watering. I only found you recently. When I see a post from you in my inbox I can't wait to open it. I have gone through your archives and found so many recipes I want to make. One thing I need to buy is asafoetida. I used to live near a Co-Op that carried it. Now the only place I know of is quite a jaunt away. I live in Texas. This coming weekend my son is coming to take me grocery shopping. One of the stores we are going to go to is the one that carries it. You have so many recipes, including this one, that use it, I have to get a supply so I have it on hand! Superb share Mayuri. Samosas looks so tempting. Come over Swathi… we'll have a tea party. Thank you Terri for the kind words. You can make most of the recipes without asafoetida. Love these crispy samosas. But we make them with aloo or keema stuffing. .. will try with paneer too. Everything looks so good! I am really in to paneer at the moment. Thank you Shobha. I also make them with veg filling. Thanks Danii, I too love paneer and its a good protein option for those who follow a vegetarian diet. Love the detailed explanation. Superb clicks too.